Usually only one word enters your mind when you think of college costs: tuition. But for all of you soon-to-be college freshmen, there are a lot more expenses in the life of a college student besides tuition. Below you will find a list of a few expenses you may not be expecting. Buying textbooks may come as no surprise to you college-bound readers, but the total amount you may pay a semester on books could come a as a shock when you get to the register at your college bookstore. 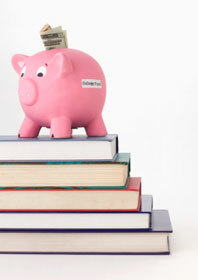 Some students pay more than $400 for one semester’s worth of books. Yikes! But never fear; there are ways to get your books without spending a fortune. Other options include buying books at a discount rate from bookselling websites, as well as renting them or getting used copies. Pulling all those late-night study sessions and overnight homework parties can cause students to get a serious case of the munchies. The expenses of snacks may come as a surprise; after all, when you are at home staying up late working on that AP European History project, you can just go to the pantry and grab as many bags of chips as you want at no expense to you. But in college, those late-night grub sessions can get a little pricey, whether it’s a small bag of chips or an extra large cheese pizza. A big part of being in college, especially if you will be attending a big school, is rallies, tailgates, and sporting events. All those campus get-togethers call for lots of spirit gear. Hats, jerseys, water bottles, t-shirts—just a few items that students enjoy buying with the name, logo, or mascot of their school on them. School spirit gear, however, is not cheap. While the prices at campus stores for clothing and other items vary, you can expect to find items as expensive as $80 or more. BONUS: Be on the look out for the sale rack. Just like in department stores, campus stores have big sales at the end of certain seasons. You may just find a t-shirt on sale for half the price. I’m not talking about that new dance club downtown! It may seem a little unfair to have to pay for a campus club or group, but this is often the case. For example, to be a DJ on WTBU, I have to pay station dues in order to continue doing what I enjoy—radio hosting! Club fees, as far as non-athletic groups are concerned, could range from $10 to $25 to participate. The upside to group fees, however, is that those fees usually go to new equipment, group outings, or events. You are no stranger to school supplies. You know the drill: pens, pencils, notebooks, and calculators. In college, while you may still need to purchase those items, you may find you need some additional supplies, including a printer, which also requires paper and ink. Purchasing a printer during an office supply store’s back-to-school sale may be much cheaper than at any other point during the year. A quality printer may be well over $100 and ink near $50. Purchasing a printer, however, is well worth the investment. Having your own printer may save you from paying for printing at your campus library. The best way to make sure you are not spending too much on other college expenses like books, food, clothing, and supplies is by paying attention to sales and to a pre-set budget. The best way to make sure your money is not being wasted on a college group is by staying committed to that group; think of your dues as an investment. Good luck and happy college savings!